We’ve taken a look at your most frequently asked questions about dishwashers. To save you time, take a look at our FAQ section where we have provided answers to the things you wanted to know most. Where do dishwashers leak from? Before looking at any of the potential reasons for a leaking dishwasher, make sure that you turn off the mains power to the unit. One of the most common areas for leaks to occur is around the door seal of your dishwasher. The door is sealed with a rubber gasket seal which creates a vacuum when closed. If this is damaged or not fitted correctly then the dishwasher has the potential to leak water. A good tip for checking the gasket; if you cannot see any obvious damage to the seal, use the ‘paper trick’. Insert a piece of newspaper into the door seal and close the door. If the seal is working correct, you shouldn’t be able to pull the paper out easily. Repeat this around the door gasket. If you notice a section where the door seal is loose, replace the gasket. Another area where dishwashers can commonly leak from is the hoses. There are two, one that fills the dishwasher and the other that drains. You can easily check for damage or cracks in the hose, water on the floor beneath them or loose connections. If you spot that a hose connection is leaking, it may just be loose. Try tightening it to resolve the problem. If there is any damage to the hose then you will need to replace it to fix the problem. The other place that you can check for leaks on your dishwasher is the water inlet valve. This is what the hoses connect to. There are also wires attached to this part of the dishwasher so ensure that your appliance is switched off before you check for any leaks. Water and electricity do not mix, so if there is any problem with water leakage here you will need to replace the valve before using the appliance again. If none of these areas seem to be the problem, there is one other area you can check before calling in the professionals. 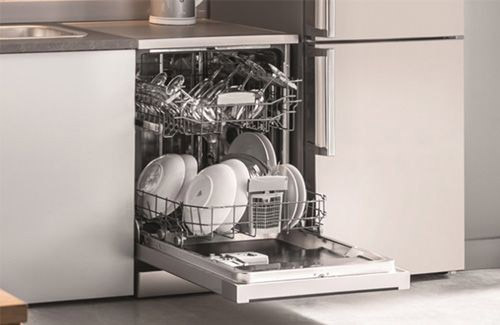 Checking the water level inside your integrated dishwasher or freestanding dishwasher could potentially reveal the issue. Switch on the dishwasher and start a normal cycle. Once the machine has filled up with water, open the door. The water level should be below the level of the door. If it is higher than this, then it is either filling up too much or there could be a problem with drainage which means that the machine has too much water inside. Your dishwasher has to cope with grease, food, sauces and other debris that you want to clean from your crockery, so it is not unusual to experience a blockage. 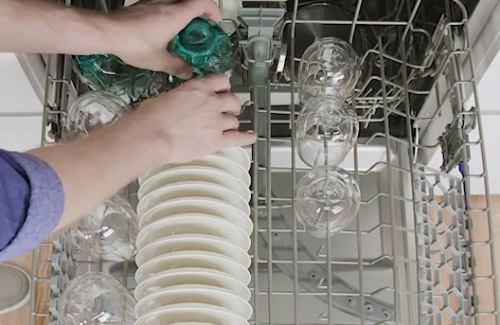 The best way to avoid a clogged dishwasher is to clear plates thoroughly before placing them in the dishwasher. Any heavily greased dishes would benefit from a wipe with kitchen towel before being placed into your dishwasher to give your drains a fighting chance. If you do experience a blockage, check the filter at the bottom of the appliance to see if there is something that can easily be removed like a few chips or a jam jar label. If you cannot see the blockage, try pouring a solution of white vinegar and bicarbonate of soda into the drain to clear anything clogging it up. If your dishwasher is holding water, manually empty it as best as you can to avoid trying to find a problem in 2 inches of grey washing up water. A wire coat hanger unfolded and inserted into the drain hose could fish out any food debris that you cannot see. Be sure to do this carefully though as you don’t want to cause any damage to the machine. If your dishwasher does not get used for a while, and the door is left shut while the inside is still a little damp, mould could start to grow. Make sure you leave the door slightly open if it’s not going to be used for a while, this will allow air to circulate inside the appliance, drying it out completely. Periodically run your dishwasher on a short ‘cleaning cycle’, or your quickest wash programme. Open the door carefully when it gets to the rinse stage and throw in a cup of white vinegar. 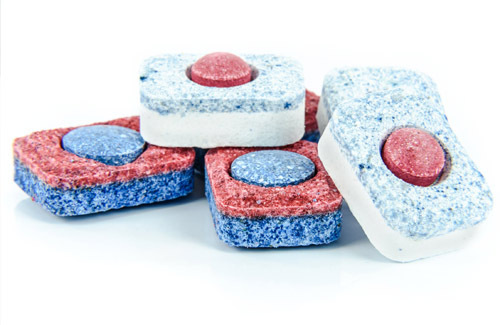 This will leave your dishwasher smelling fresh and looking sparkling clean. Technically, to sterilise an item it must be boiled at 100°C for 5 minutes. Even on the hottest temperature setting, your dishwasher will not reach boiling point. Whilst you can be assured that your dishes and glasses will be super clean, your dishwasher is not a suitable replacement for a steriliser to use with babies’ bottles etc. Can dishwashers run on cold water? Your dishwasher should be connected to the cold water supply. 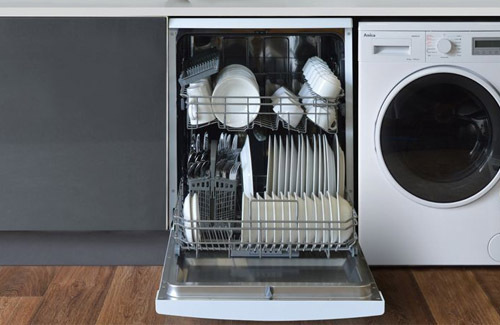 There is an internal heater inside your dishwasher that will heat the water for the different wash programmes. Yes. Dishwashers can be recycled at your locate recycling depot. Depending on your local council’s rules and regulations, you may need to telephone ahead to let them know that you are bringing a dishwasher in. This is the best and most responsible way to dispose of your old appliance. Our team of engineers are based all around the UK, ready and waiting to come out to you if you experience a problem with your dishwasher. Their vans are stocked with the most commonly used parts so that they can achieve some of the best first time fix rates in the industry. Most problems can be repaired so give our friendly customer care team a call on 01949 862000. If you are thinking that dishwashers are a relatively new invention, think again! The first dishwasher that was operated with a hand crank and splashed water onto dishes was invented in the late 19th Century. It consisted of wire sections that held the dishes up to the water being sprayed onto them. The original design was primarily created for use in the hotel industry, with domestic versions not becoming available until around the 1950s. The 1950s saw many household appliances being launched onto the marketplace including the domestic refrigerators and washing machines. These were all designed to free up some of the time taken to complete domestic chores by the typical 1950s housewife. These appliances were part of the kitchen revolution that began to set women free!